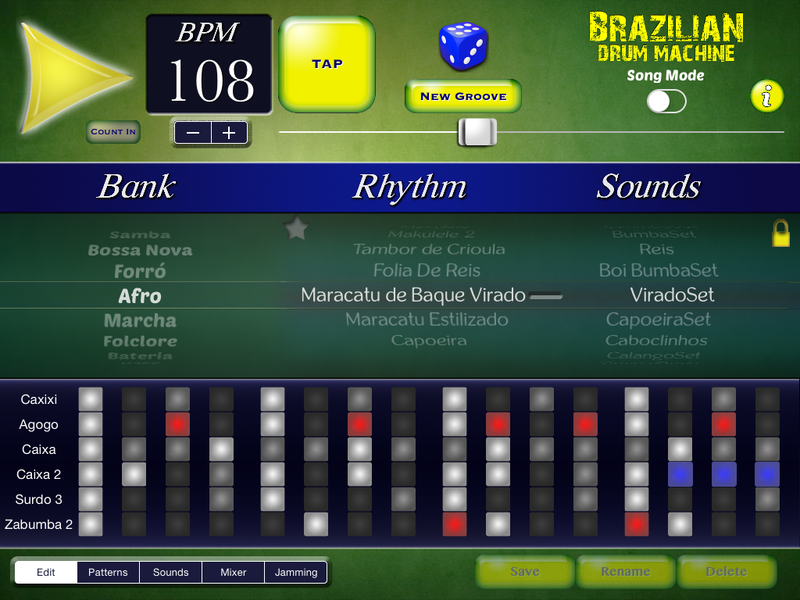 Brazilian Drum Machine is the new brazilian rhythm section for iPad and iPhone. Easy, fast and flexible because you can use the preprogrammed rhythms or create your own grooves. Combine rhythms with the fast and intuitive Song Mode. • Complete rhythm library with all the amazing brazilian grooves. Samba, Partido Alto, Baião, Bossa Nova, Marcha, Choro, Carimbó, Maracatú, Coco, Xote, Maxixe, Makulele, Calango, AfroSamba, Coco, Frevo, Ijexá, Calango, Capoeira … and many more! 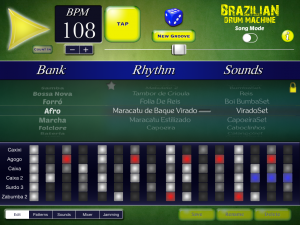 • More than 60 brazilian percussion sounds with Round Robin alternating samples with 4 layers. Extremely realistic sounds, including Pandeiros, Caixixis, Surdos, Cabasas, Tamborims, Ganzá, Shaker, Chocalho, Caixas (Snares), Agogos, Atabaques (Congas), Drum sets, … and many more! • Jamming Mode to set the improvisation level. The acclaimed improvisational ability has been adapted to Brazilian percussion. No one may guess that is a machine! • Set drum fills every x bars, with brazilian triplet feel that makes the groove to sound incredibly human. • Song Mode allows to make full structures in seconds. Just adding parts choosing rhythms, number of bars, jamming level and fills. Easy, fast and fun. • Create your own rhythms in two modes: Step Sequencer and Patterns wheels. • Ranzomizers tools for sounds and patterns to boost the creativity. • Bateria (Drumset) bank with the traditional brazilian rhythms adapted to a drum set. • AudioBus and inter-app support to stream live audio directly to other apps. • Universal app: works on iPhone, iPod and iPad. This entry was posted in Brazilian Drum Machine on May 4, 2015 by LumBeat. APP DOES NOT FUNCTION WHILE IN CONNECTION WITH ÁUDIO BUS TO GARAGE BAND , THE SOUND DOES NOT APPEAR OR PLAY IN GARAGE BAND. IS THERE A MANUAL TO UNDERSTAND WHAT IS GOING ONE . THANKS, FOR THIS INCREDIBLE APP. I HAVE A WORKSHOP IN PROCESS AND NEED ASSISTANCE. Hello Henrique. Sorry for the audio exporting issues. It’s already fixed, and the update v1.01 will be available in a few days.